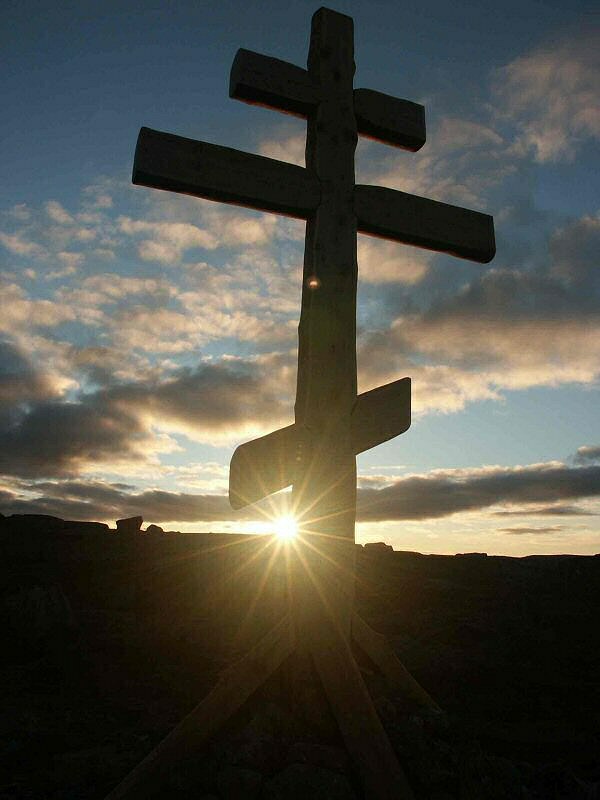 A cross has been erected, surrounded by a cairn of stones, at the peak of the mountain behind Rynda House. It faces East looking out over the territory known as the Atlantic Salmon Reserve or Дом для лосося. 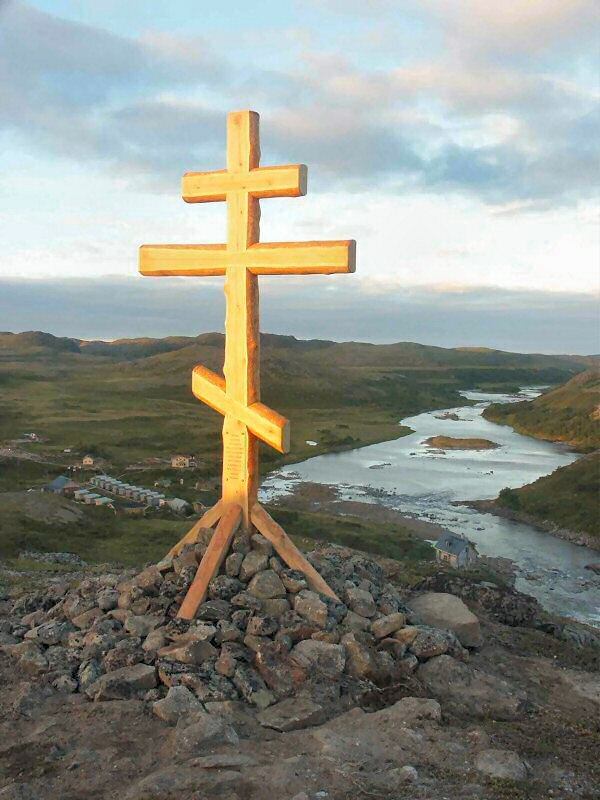 It is a tribute by the Russian Orthodox Church to our environmental work and intended as an example to others. It is also a public statement that may alleviate some of the natural suspicions of the Murmansk people. We wish to take this opportunity to thank Governor Yuriy Alexeevich Evodokimov for his enlightened support without which our mission would not be possible. 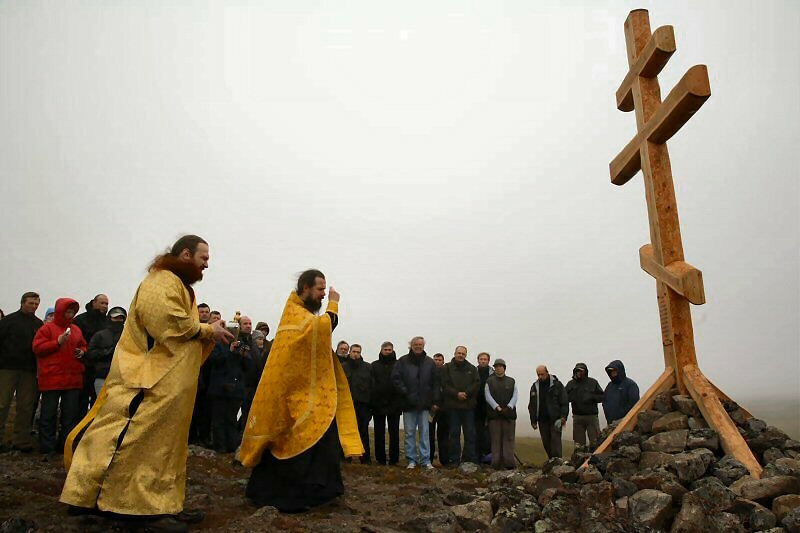 The Rynda Cross was consecrated on Saturday, 9-Sep-06, at the initiative and under the authority of Patriarch Simon, by Father Genadiy of Svyato Nikolskiy Cathedral, Murmansk, assisted by Archdeacon Nikita. The Patriarch himself has graciously accepted an invitation to visit us for a few days in 2007. 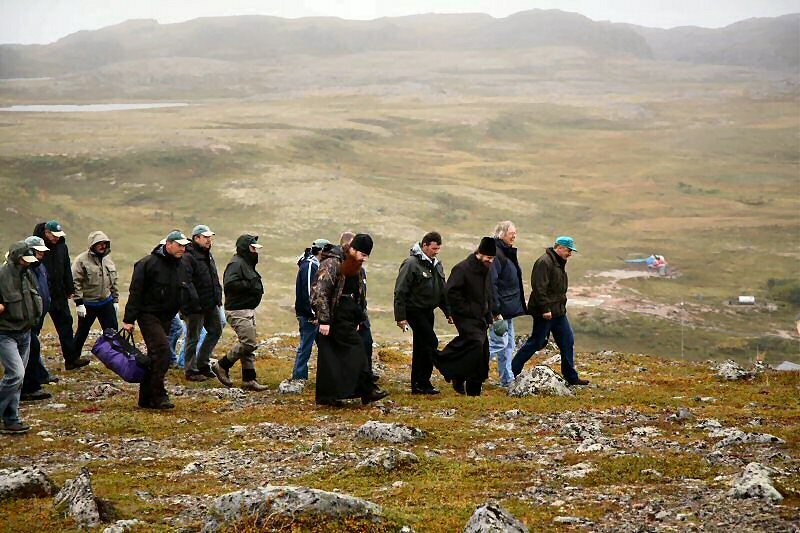 An extraordinary logistical plan was put in place to bring together a large gathering of Russian people who enjoy the culture of fly fishing by catch “catch & release” and who share the same values about conservation and respect for nature. They came from Moscow, Murmansk and Kharlovka Camp. Despite atrocious weather we were able to gather together on the top of a mountain 150 miles north of the Arctic Circle. It was one of the most moving moments in our lives. There kindred spirits stood in the wind amongst the clouds before the magnificent cross looking down on our beloved Rynda. Father Genadiy led us through a beautiful ceremony with prayer and song entwined with physical expressions of humility and obeisance before God and nature. Everyone there fought to control their emotions and knew they would be forever touched by a combination of solemnity and joy. Maybe some of us thought we had a better understanding of the meaning of life. All of us thought about absent loved ones because we knew that we would never be able to fully describe what it was all about to anyone who was not there. We didn’t come down as one. After lingering near the cross the congregation left in friendly groups so that by one o’clock we came together in Rynda Lodge. There the staff had re-arranged things by extravagant design. The tables were set against the walls showing of a splendid feast against the background of our memorabilia. Champagne or vodka was the order of the day and in the Russian manner speeches and toasts, and counter toasts, were made becoming more amusing and a little repetitive as the day wore on and the autumn light began to fade. And so, one of the finest days in our lives came to an end. The cross stands 15 ft tall by 1 ft in width. It is made from a Larch tree found only found in Siberia. 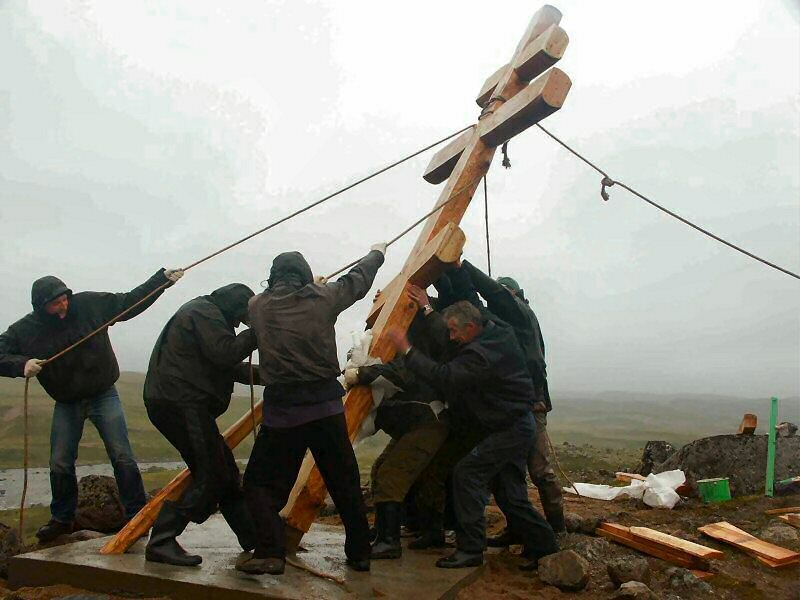 The craftsmen who made the cross believe that, without human interference, it will still be standing at Rynda in 500 years. For some strange reason the wood will remain bright and fresh looking for the first 100 years and then it will slowly turn to a shade of grey. The “surroundings” referred to are the watersheds of Kharlovka, Eastern Litza, Rynda & Zolotaya Rivers covering 1.8 million acres. 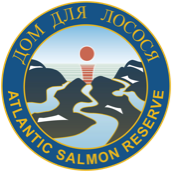 The Дом для лосося (Atlantic Salmon Reserve) was founded by Peter Power in the year 2003. Buried beneath the cross the guides & staff of the Дом для лосося have placed a “time capsule”. It contains a photograph with their names together with a private message expressing a love of nature and a prayer for the future of our planet. 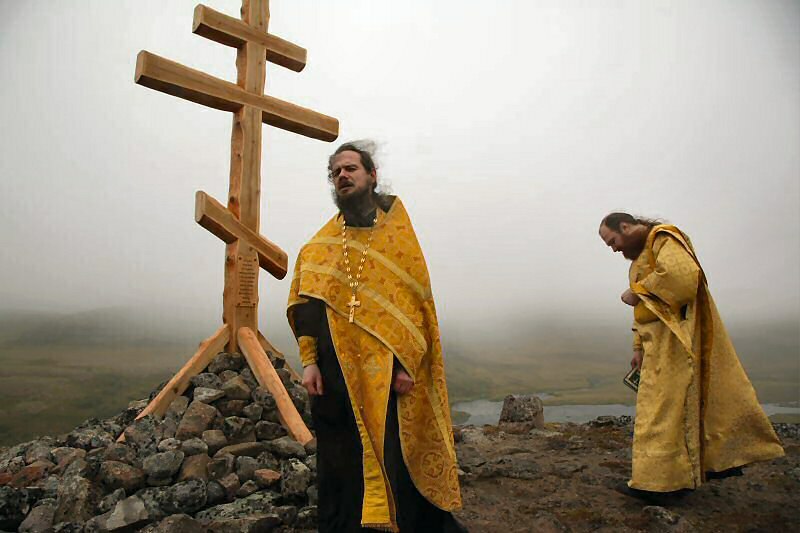 The Russian Orthodox cross consists of three bars, the lowest bar low and slanted. The top bar represents the “INRI” sign placed over Jesus’ head. The meaning of the slanted bar is not known for sure, but probably represents St. Andrew’s cross (which looks like an X). St. Andrew is believed to have introduced Christianity to Russia. INRI is the Latin abbreviation for “Jesus Christ, King of the Jews,” the sign placed above Jesus’ head on the cross (John 19:19). Although the sign was intended to mock Jesus, Christians view the phrase as a confession of faith. Father Genadiy, Archdeacon Nikita, you have just performed the most beautiful ceremony most of us will ever see. All of us here want to express our heart felt thanks to you for coming here to consecrate the Rynda Cross. You have touched upon deep emotions within us. We have felt the presence of God. For the rest of our lives we will treasure the memory of this occasion. We are honored that the Holy Russian Church, through the authority of Patriarch Simon, should choose this place to send out a message to mankind. I have been involved in many adventures in many countries. There have been none as important as the “Дом для лосося” (Home for Salmon) to which I have dedicated my life here in the tundra. I have done so because at this place I find myself working together with a wonderful community of Russian people in an activity which has a spiritual dimension. The success of our work is measured by the human happiness we strive to make possible in our Russian and international guests. It is measured by our successful conservation of the Atlantic Salmon. It is measured by our never ending effort to protect these unique natural surroundings and to maintain them in pristine condition. Here a community of people choose to live out their summer days in mutual respect and in harmony with nature. Everything we do here is affected by our understanding of the fragility of this eco-system. 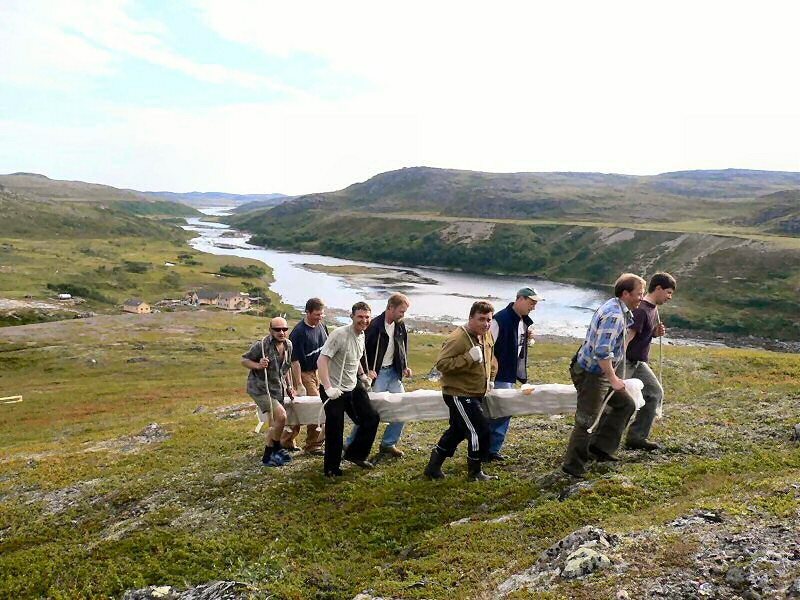 It is the last remaining pure tundra in Europe. It is a precious Russian national asset. I would like you all to know that buried beneath this cross the guides & staff of the Дом для лосося have placed a “time capsule”. It contains a photograph with their names together with a private message expressing their love of nature and a prayer for the future of our planet. Let us pray that they are permitted to continue their work and that their example will be followed by others. God bless us!